APPLE smashed all smartphone price records this morning, unveiling its biggest iPhone screen inside its most eye-wateringly expensive mobile phone to date. The Apple iPhone XS Max, due in Australia on September 21, will feature major upgrades to its display, its speed, its cameras, and even its colour, but it will cost Australian buyers more than $2000 for the first time, breaking last year's record price for the iPhone X by more than $500. 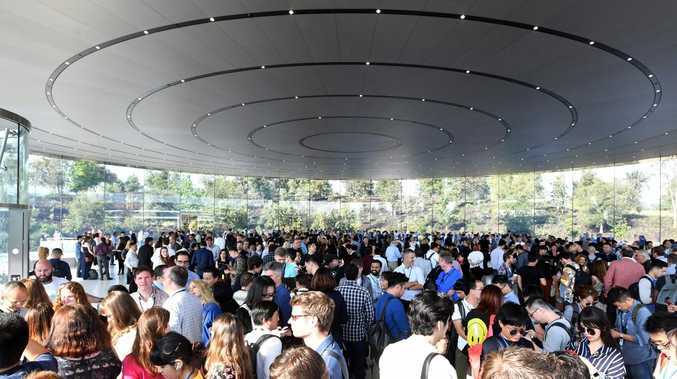 The Cupertino tech giant also revealed a smaller iPhone XS, and a budget model dubbed the iPhone XR at its launch event, held on its spaceship-shaped campus inside the Steve Jobs Theatre. Apple worldwide marketing senior vice-president Phil Schiller revealed the company's new flagship device would be the first iPhone to feature a 6.5-inch screen, making it even bigger than Samsung's famously large Galaxy Note 9. "This is the biggest display ever on an iPhone," he said. "You can see it's about the same size (as the iPhone 8 Plus) phone with a much larger display. We think there are a lot of customers who are going to love this bigger display." The iPhone XS Max, which will cost as much as $2369 when it arrives in Australia on September 21, will also feature "the smartest and most powerful chip ever in a smartphone," Mr Schiller said, as well as up to twice the storage of the previous model at 512GB, more durable glass, and upgrades to its camera with larger image sensors and artificial intelligence to automatically recognise scenes and facial features. 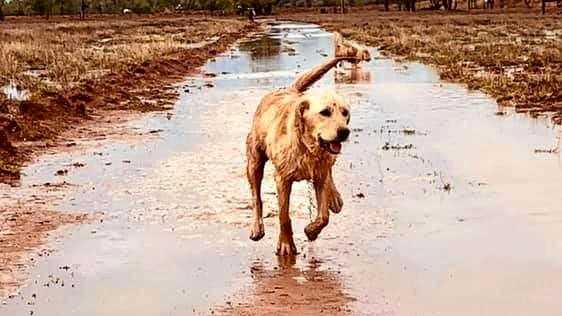 "You are going to be blown away with the pictures you can take with the iPhone XS camera," Mr Schiller said. "Some people call this computation photography. It's making images possible now that weren't before." XS MAX, I keep seeing "EXCESS MAX." It sounds a new Pepsi Beverage. The dual 12-megapixel rear cameras on the new iPhone XS models will let users alter background blur on images after they've captured them for the first time, and deploy a mode called Smart HDR that would use artificial intelligence to identify scenes or even users' eyes. The new iPhone XS Max will also feature the largest battery added to an Apple phone to date, and both new iPhone XS models will be capable of using two SIM cards and two phone numbers at once. The XR has Apple’s new A12 Bionic processor, which is the same chip in the more expensive models. 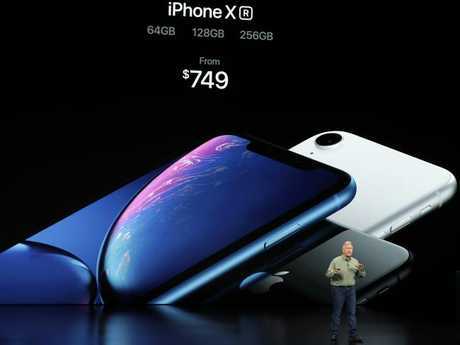 To balance the record-breaking price of the new iPhone XS models, Apple will also launch a new cheaper smartphone, called the iPhone XR, though even it will cost a minimum of $1229 and up to $1479 for the 256GB model. The iPhone XR will feature an aluminium frame, a 6.1-inch LCD screen, just one rear 12-megapixel camera, facial recognition, and the company's new A12 chip. Mr Schiller said the iPhone XR was introduced to help Apple "reach as many customers as we can". "There is an absolute limit to what smartphone manufacturers can charge for their handsets and we're probably not far away from that with the current technology," he said. Mr Fadaghi said the rising price of mobile phones would force many buyers to hold on to their handsets for three to four years, rather than replacing them every second year. Apple's price rise comes just one month after Samsung launched its most expensive smartphone, the Galaxy Note 9, at a top price of $1799. 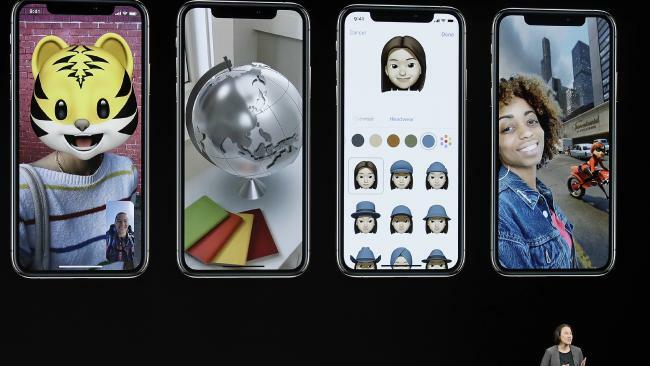 Creative Strategies analyst Carolina Milanesi said some iPhone buyers might hold off buying Apple's most expensive smartphone this year, with a survey of 955 smartphone users finding fewer than one in five would have paid for a bigger version of the iPhone X. "When asked if they agreed with the statement 'I would have paid even more for an iPhone X with a larger screen size had it been available' only five per cent strongly agreed and another 14 per cent said they somewhat agreed," she said. But Ms Milanesi said the result did not account for the top iPhone's new features. Apple is currently the world's third biggest smartphone maker, behind Samsung and Huawei, according to Gartner.